Acquaint yourself thoroughly with the installation modes including integrated, firewall, and cache. Build the local address table (LAT) and how it is sometimes built for you. Upgrade a Microsoft Proxy Server 2.0 computer to ISA Server. Back up the Proxy Server 2.0 configuration. Troubleshoot the inevitable problems posed by the exam and real life, of course. Configure and troubleshoot outbound Internet access. Configure ISA Server hosting roles: Web SSL, Exchange etc. Configure and secure the firewall in accordance with corporate standards. Configure the packet filter rules for different levels of security, including system hardening. Create an array of proxy servers. Assign an enterprise policy to an array. There's only three different kinds of clients: Web Proxy, Firewall and SecureNAT. Know everything about each of them cold. Become intimately familiar with autodetection. Troubleshoot problems with security and network usage. Analyze the performance of the ISA Server computer. Methods include the use of Performance Monitor, reports, and log files. Optimize the performance of the ISA Server computer. Considerations include capacity planning, allocation priorities, and trend analysis. 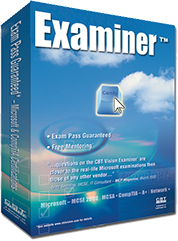 For a list of all the topics you need to know to pass this exam you can visit Microsoft's official web page for the 70-227 exam.